Great set, great price. My first choice for online shopping is always overstock. I would and I have recommended them to all my family and friends as a great place to purchase everything you need. The Tiffany Comforter Set provides the perfect preppy update to your bedroom. The pretty blue and pink floral motif makes its way three quarters of the way down the bed and then a blue and white pinstripe finishes the last quarter and also covers the reverse. Two decorative pillows use ruching techniques for an extra frilly look to the top of bed. Set includes one comforter, two matching shams(one in Twin/ Twin XL), two decorative pillows. I LOVE the different patterns together and the colors are beautiful (there are large navy buttons "connecting" the striped fabric at the bottom to the floral fabric of the comforter!). I wanted to use a coral accent color in the room, and the peach color is much lighter than I wanted; so a mix of coral and peach accents would be great together. The reason I'm going to use this set for guests is because the aqua color dominates the the color palette. Although the aqua is very pretty, it overwhelms the navy and coral colors that I want to be the focus. Love the design and accents. Really disappointed that the aqua is the focal point and doesn't work for me. I purchased this for my daughter. She absolutely loves it! The shams fit her pillows perfectly and the accent pillows included with the comforter are a great addition. Beautiful bed set overall. It has very vibrant colors and patterns. The reversible comforter is great for quick changes to the room. The Queen size fit perfectly on our pillow top. The comforter is quite warm for its thickness. A great deal for the price. We love it. We just ordered sheets to match! 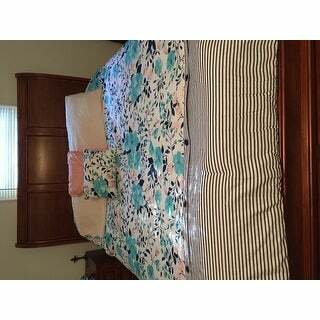 Very pretty comforter set at a great price. Definitely recommend. Great value, the colors are beautiful. This is a perfect fit in my daughter's room. The only reason that I am giving 4 stars, instead of 5, is b/c a button has fallen off & we purchased less than 2 months ago. (They aren't sewn on well.) Still, I consider this to be a great buy. Love the color and the weight of the comforter. The accent pillow are a plus! Would definitely recommend! Very pretty comforter set, beautiful colors. Perfect for a spring bedder or just year round to put in a teenager room or even just yourself! I love that it comes with decorative pillows as well. I bought this set for my master bedroom. It fits nicely on my bed. The comforter is very warm, though the temperature hasn't completely dropped yet. In my opinion it was worth the price. This is the perfect bedroom set for our guest room! I think it looks so friendly and welcoming! Perfect color pairings and pattern and overstock provided it at a great price! I wanted to love this item but after one wash the blue color stained into the white stripes. The colors are a true match to the picture which I love. The material is very silky which I did not expect but the light weight design is nice. Overall if the colors had not changed after washing I would be rating this a five. I bought this set for my daughter and she loves it. We have only had it about 2 days now. It is exactly what I expected and fits her bed perfectly. I would reccomend this comforter. Beautiful in person. Daughter picked it outfor her new room and was thrilled when it arrived. I like the quality of the comforter. It seems like a nice material that would be good for a college dorm. It matches the pictures posted perfectly! I am very happy with my purchase. I even recommended it to my roommate! I love bright and pretty.This filled both categories. Not bad for price. Multiple washes and still doing it’s job. "What color sheets would mach well with this color? I don't want white because it stains easily." I went with navy blue sheets and they look great together!